I AM INVINCIBLE (AUS) (Bay 2004-Stud 2010). 5 wins-1 at 2, SAJC DC McKay S., Gr.3. Leading Aust. First Season Sire 2013-14. Sire of 379 rnrs, 284 wnrs, 29 SW, inc. Brazen Beau (VRC Coolmore Stud S., Gr.1), I Am a Star, Viddora, Hellbent, Illustrious Lad, Invincible Gem, Look to the Stars, The Justice League, Santos, Super One, Most Important, Voodoo Lad, Houtzen, Invincible Star, Overshare, Eckstein, Fiesta, etc. Invincible Dream (f. by I Am Invincible). 2 wins. See below. Shining Eyes. Winner at 1600m in Aust. Salvation Creek. Winner at 1000m in Aust. Spur of the Moment. See above. LA NIKITA (Desert Sun). 4 wins. See above. Under the Leaner. 6 wins-2 at 2-from 1100m to 1650m, A$151,150, MRC Spinal Cord Injury Network Christmas Cup, 2d Ipswich TC Optus H., MRC Carpet Call H., 3d MRC Catanach's Jewellers 2YO H., VRC Ken Cox 2YO H., MVRC LF Signs Inglis Bonus H., SCTC Hahn Super Dry P.
El Grande. 4 wins at 1200m, 1400m, HK$2,897,600, HKJC Lok Wah H., HKU Faculty of Architecture H., Saturn H., HKU Faculty of Social Sciences H., 2d HKJC Citibank Citigold H., Sporting Exchange H., Jardine H., Middle H., Black's Links H., 3d HKJC Muk Min Ha H., Nurturing the Young H.
Flavian. 5 wins to 1300m, A$78,875, to 2016-17 in Aust. Azcannyaz. Winner at 1200m, A$81,370, in 2016-17 in Aust. Cass 'n' Black. Winner at 1800m in 2016-17 in Aust. Manfred the Man. 13 wins from 1000m to 1650m, A$117,305 in Aust. Elite Hong Kong. 2 wins at 1100m to 2017-18, 3d ATC Schweppes H.
Judge's Rule (The Judge). 10 wins to 1200m, A$97,535, MVRC Chanak H., Dhaulagiri H., Woodlands H., Coburg H., SAJC Beaumont Babe H., VATC Kingston Heath H., 2d VRC Gallantic H., L, Air Force H., Troa Trophy H.
The Senator (The Judge). 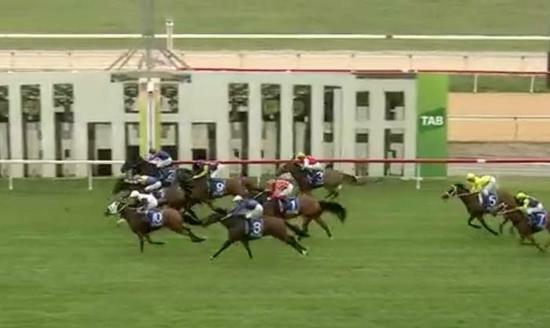 4 wins at 1200m, 2d VRC Maribyrnong Trial S., L, VATC The Weekly Times H., 3d MVRC St Albans S., L.
Zeddez (Zeditave). Winner. See above. The Mooksta. 18 wins to 1400m, A$282,240, MVRC Eliza Park Flying H., MRC Stan Shannon H., MVRC AFS Security Group H., VATC 100% Smokefree Indoor P., IGA Ninja H., Dubbo H., 2d MRC Clay Hero H., VRC Piastre H., MRC Everyone's a Winner at Sandown H., Qubeau H., VATC Deakin H., 3d VRC Kokoda Track H.
Don't Tell Tom. 11 wins to 1250m, NZ$1,500, A$223,480, Mackay TC Newmarket H., MRC Dual Choice H., VRC Red Tempo H., 1100m-in track record time, MVRC Velisha Fresh Produce H., QTC Cockatoo Ridge H., 2d BTC Doomben Dash H., 3d MRC Cromwell H., MVRC Staff Australia Flying H.
Kellysong. 6 wins to 1400m, A$102,000, AJC Springfest H., STC Konica Minolta H., De Bortoli Noble One H., 2d STC Coolmore Series H. Producer. Runaway Fairy. 4 wins at 900m, 1000m in Aust. Handed Down. 2 wins at 1000m, 1200m in Aust. Moonchka. 5 wins to 1250m, A$81,113, WATC Par Valis H., Perfect Rhythm H., British Steel H., 3d WATC Carlton Mid H., Mirrow Magic H., Provincial Championship Series Final H., Avenida Madero H., Opening Twist H.
Sender Burglar (Burglar). 21 wins-1 at 2-from 1000m to 1600m, A$84,845, VATC CUB Welter H., WATC Davidson Sprint H., 2d VRC Leonard H., L.
2 wins at 1000m in 2017-18 in Aust.